Instantly update your home's curb appeal with window shutters. New double-hung windows can be raised to let in sea breezes; likewise, the aluminum louvered shutters can be closed to protect the glass from storm-force winds. Long six-over-six windows without transoms keep the look sleek. Pairing the windows with slender, three-banded louvered shutters is both pretty and practical. They’re less prone to warping and stronger than shutters with fewer bands. The siding, shutters, and trim are painted Swiss Coffee by Benjamin Moore. These cottage-style windows have a top sash that's shorter than the bottom—making them appear taller. 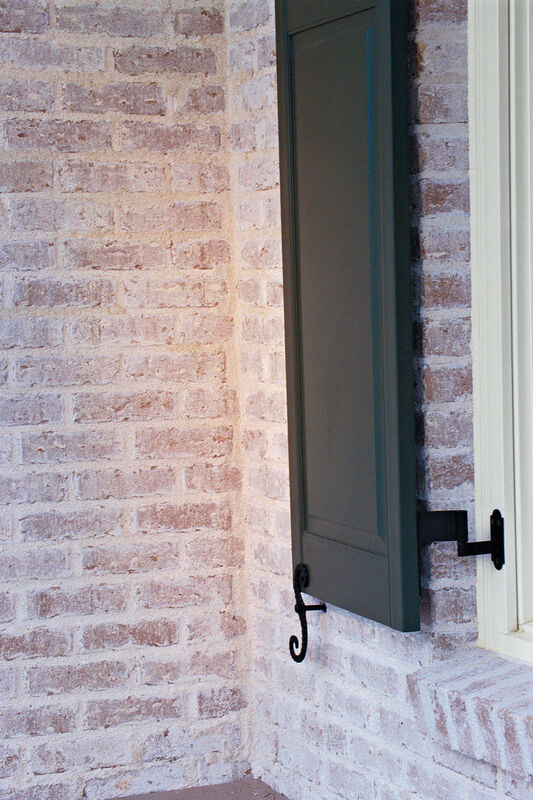 Paneled shutters are outfitted with operable iron hardware. Board-and-batten shutters lend a more relaxed feel than louvered ones. The louvered look isn't for everyone. These solid-panel shutters offer extra protection for two pairs of patio doors. The shutters fold back flush against the wall when opened. Whether for decoration, privacy, or protection from the elements, shutters add interest and texture to a house. The ones on the second story of this Florida home can close off the porch or be opened to let in Gulf breezes. The beauty of stained-wood shutters is hard to beat. The natural-colored louvered panels flanking this entrance feature a curve at the top so they can be closed seamlessly into the door frame. Awning, or Bermuda, shutters shown here on attic windows in Gorham's Bluff, Alabama, are hinged at the top and held open with support rods. Originating in the tropics, Bermuda shutters were designed to capture ocean breezes and to provide shade from the relentless sun. Guess what's behind these closed shutters? (Hint: It's not a window.) Shutters can be fixed inside a false opening to help achieve symmetry on a home's exterior. This Kentucky home displays the timeless look of operable, louvered shutters held open with hinges and holdbacks called shutter dogs. Shutters, however, can be just for show. New and more maintenance-free materials such as vinyl, plastic, and lightweight metal are now on the market, making it easier and less expensive to add decorative shutters to any facade. Introduce pattern and color to a flat exterior. These board-and-batten shutters (flat boards butted together and held in place with a batten to make a solid surface) are painted in a bold red-and-black design. Four sets of French doors, each flanked with 10-foot louvered shutters, stand in for front windows and blur the line between indoors and out. Window shutters are the perfect way to add pops of personality and color to your home. Brightly colored window shutters give this neutral town house a needed style boost.